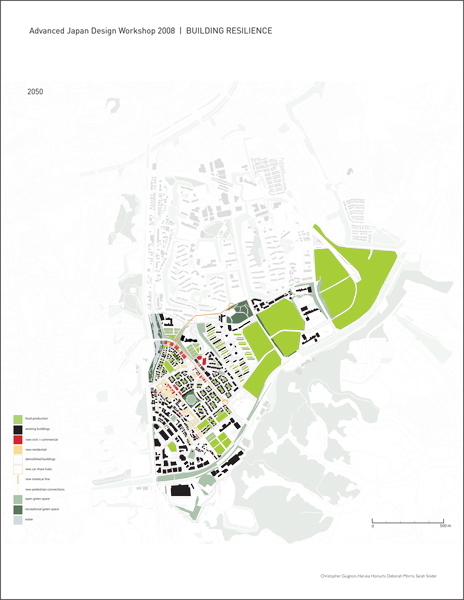 The work shown here is an excerpt from a 50-year urban scale proposal for the future of Tama New Town, a residential development first designed and built in 1965. 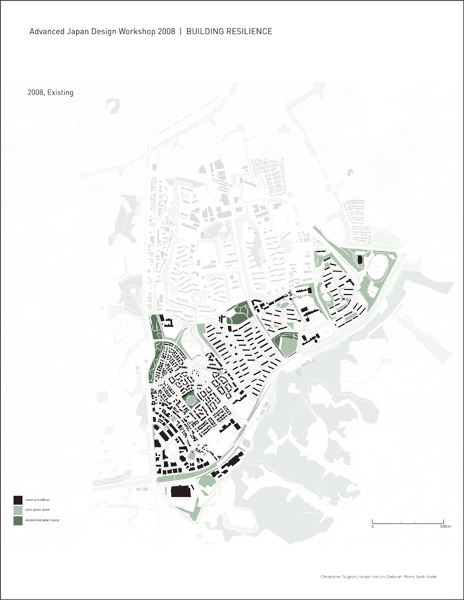 Though originally conceived of as a new town for young working families, changing demographics, aging building stock and distance to the city center has resulted in an acute population decline. Without radical intervention, Tama will not continue to subsist. Zooming out to look at the entire Tokyo metropolitan area as an interdependent system of infrastructural nodes, we can see that each nodal point is a vital part of keeping the entire network strong. 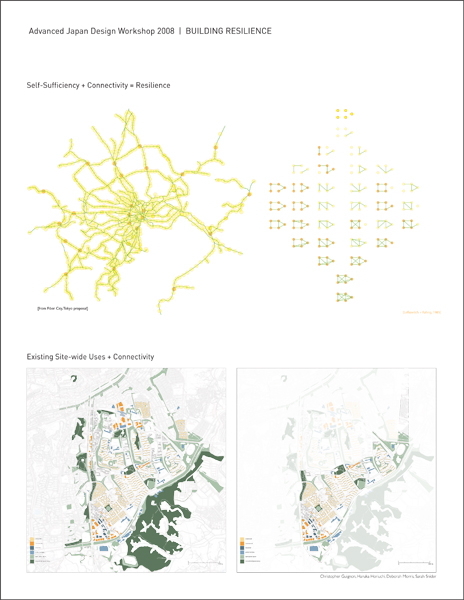 If each population center declines to the point that its local infrastructure is no longer viable, the network will slowly disintegrate, and Tokyo will lose its strength as a well-connected metropolis. Simultaneously, we see that each nodal point thrives because of the robustness of the network. Therefore, envisioning a future for Tama New Town is crucial, not only for local residents, but for the entire region. Thus we have our driving concept for the future of Tama: self-sufficiency + connectivity = resilience. Each point in the network must strive for a level of self-sufficiency in order to survive as an autonomous place, so that the network can remain viable. 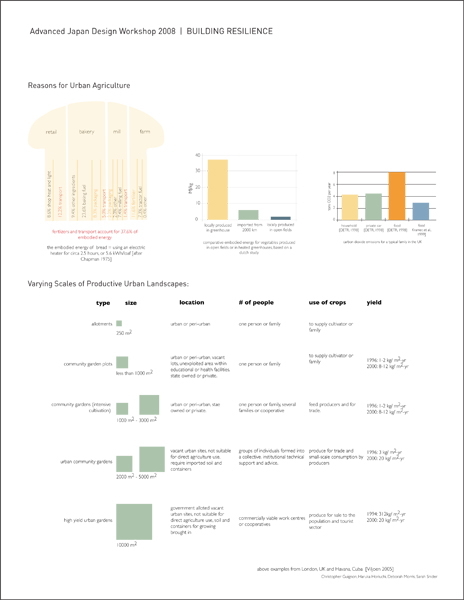 Together, these factors lead to a resilient city of the future. The existing urban core of Tama (where it exists) should be preserved and intensified, in order to maintain a sufficient population and urban energy for the existing monorail/train/subway station. By building up urban infrastructure locally, we are investing in the longevity of the network. Many of the low-density residential buildings are simply not worth refurbishing. The majority of the existing building stock of 5 to 10 story apartments lack elevators, and the increasingly elderly population cannot comfortable reside in these structures. Further, the overall population of Japan is aging rapidly, and the types of young families that Tama was designed for no longer exist. 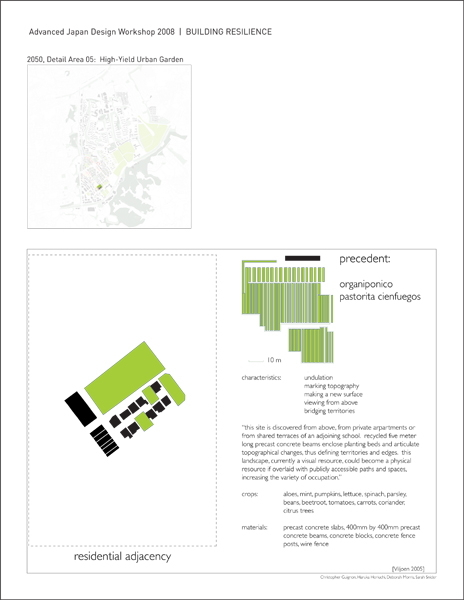 Depending on the specific building and layout type, a multi-pronged strategy will propose parallel methods for appropriately converting each under-utilized area into food production: community gardens around courtyard housing, educational farms at public schools, vacant land into community-supported agriculture fields, existing non-elevator buildings to vertical farms (i.e. mushrooms, hydroponics, etc. 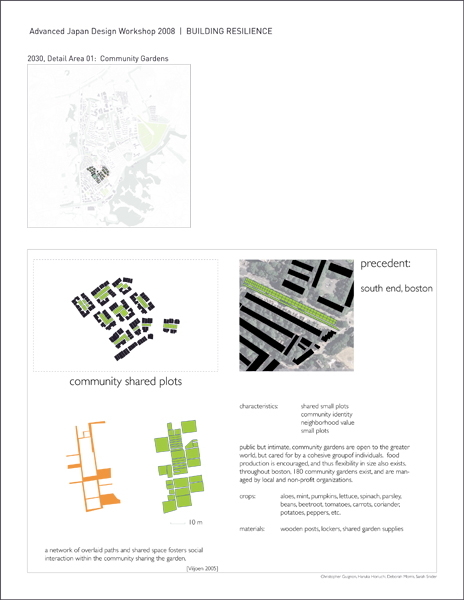 ), and empty lots adjacent to high density housing into high-yield urban gardens. With the implementation of these strategies, the population of Tama will be able to eventually support itself locally, and perhaps even become a valuable asset to the metropolitan region. All images shown here were created by Haruka Horiuchi. 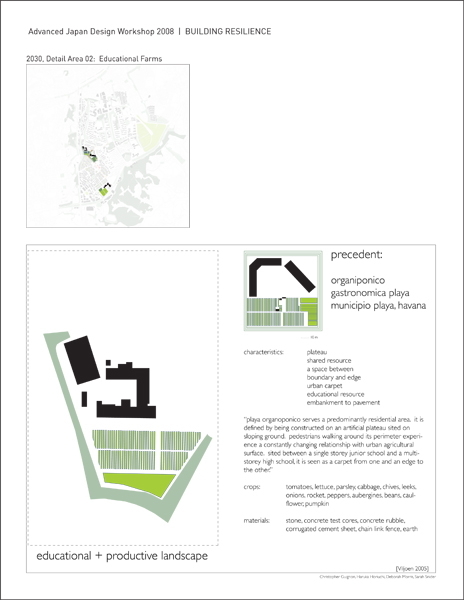 The full proposal was created in a mixed team of architects and urban planners - Christopher Guignon (M.Arch. 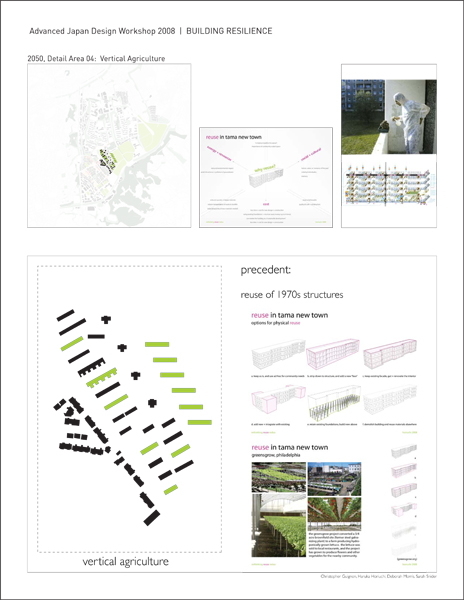 ), Deborah Morris (MCP), Sarah Snider (MCP), and Haruka Horiuchi (M.Arch.) 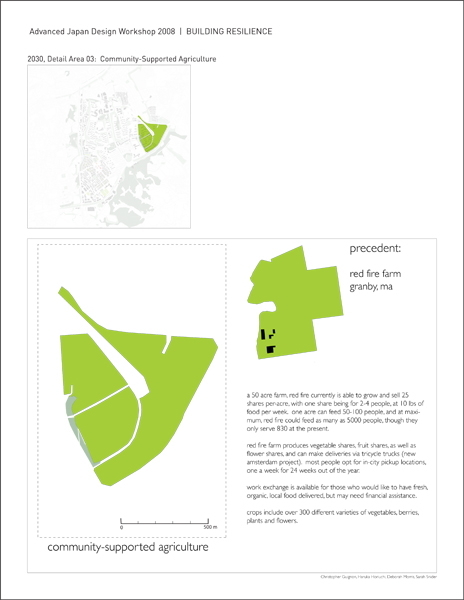 - during a collaborative workshop taught by Shun Kanda, Adele Naude Santos and Andrew Scott during the Fall 2008 semester.